Most phono preamps do one job. This one goes above and beyond to help you enjoy your music. A phono preamp has a pretty simple job: boost the tiny signal coming from your turntable so you can hear the warm, detailed analog sounds etched into your records. The Music Hall PA2.2 does that admirably well, but it does a lot more. 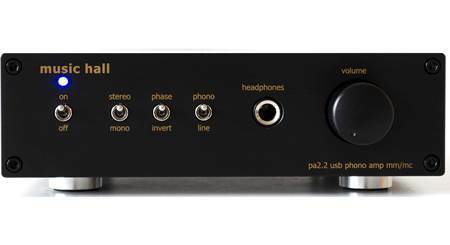 The Music Hall PA2.2 is a phono preamp, a headphone amp, and an analog to digital converter all in one. First of all, the PA2.2 works with both moving magnet and moving coil cartridges, so it can handle your current turntable, and whatever you might get in the future. If you'd like to hook up a tape deck or CD player, there's a second set of RCA inputs so you can enjoy them as well. There's also a built-in Type B USB port that feeds crystal-clear 24-bit/96kHz digital output to your computer, where you can save each track as a digital file. A superb Wolfson analog-to-digital converter ensures that those files will sound rich and full and, well, vinyl-like. 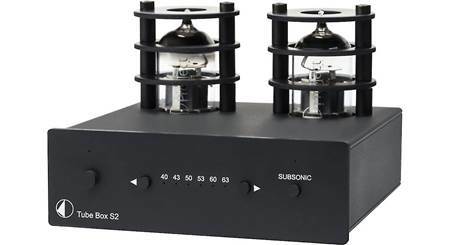 Like all phono preamps, the PA2.2 has a fixed line output for connecting to a receiver, integrated amp, or powered speakers – basically anything with its own volume control. As an unexpected bonus, it also offers variable output so you can connect directly to a power amp and control the volume with the PA2.2's built-in volume knob. That's an added degree of versatility and control that audiophiles love. And, for those times when you need to retreat into your own lush musical hideaway and leave the outside world in silence, the PA2.2 offers a way to plug in any pair of headphones with a 1/4" jack. The PA2.2 was a perfect compliment to my new Music Hall turntable. I enjoy listening to music through my headphones. 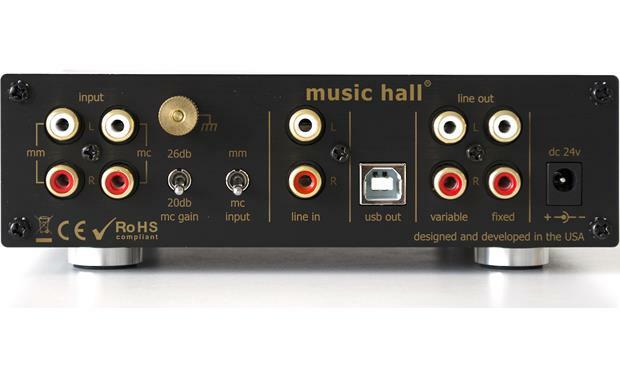 Phono Preamplifier: The Music Hall pa2.2 is phono preamplifier which can be used with turntables what are equipped with moving magnet (MM) or high output moving coil (MC) cartridges. 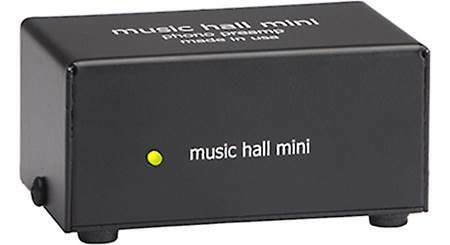 MM/MC Input: The Music Hall pa2.2 is equipped with a MM and MC phono input. Before setting the MM/MC switch, the unit must be disconnected from the power supply and amplifier. Once disconnected choose the appropriate setting MM/MC for the cartridge you're using. MC Gain: If you are using an ultra-low output moving-coil cartridge you can add an additional 6dB of gain by switching the mc gain switch on the back to 26dB. If you're using a standard low-output moving coil cartridge best results will be obtained with the 20dB gain setting. Ground Terminal: The pa2.2 phono preamplifier/headphone amp has a turntable ground, in case your turntable has a separate ground lead. This provides shielding to the tone-arm and the sensitive circuitry in the turntable. 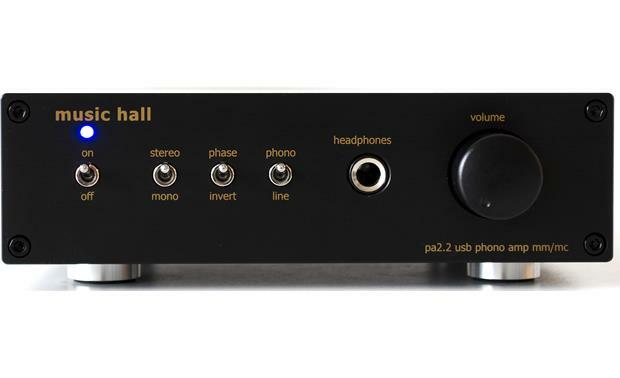 Headphone Amp: The Music Hall pa2.2 is also a headphone amplifier with a front-panel 1/4" headphone jack to connect one pair of headphones (32-600 ohms). The rotary knob on the front-panel can be used to control the volume level of the headphone out. 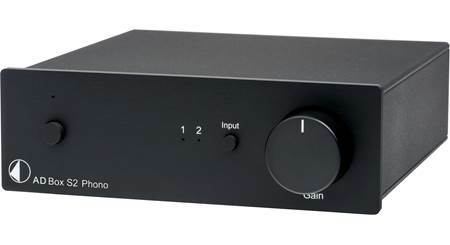 Line Input: A rear-panel analog stereo RCA input allows you to connect a CD player, tape deck or tuner to the Music Hall pa2.2 phono preamplifier/headphone amp. The Line Input is output from the pa2.2's fixed or variable line outputs, headphone output, and USB-B out. Fixed or Variable Line Out: One the rear-panel of the pa2.2 you have the choice between a variable or fixed analog stereo RCA output to connect to your power or integrated amplifier. The variable output will allow you to adjust the volume level of the output with the volume control on the front-panel of the Music Hall pa2.2. The fixed output requires you adjust the volume level from your amplifier. A/D Converter w/ USB-B Out: The Music Hall pa2.2 is equipped with a Wolfson WM8786, Tenor TE7022L 24-Bit Delta-Sigma A/D converter and USB-B out for connecting the phono preamp to your Windows PC (XP-up) or Mac computer (OSX 10.6.6-10.11). By connecting the pa2.2 to your Windows PC or Mac computer, you can record your vinyl records as 2ch PCM digital music files (up to 24-bit/96kHz). When you plug in the pa2.2 your computer will automatically recognize it and download any necessary drivers. You will need to download a 3rd party recording software. The preamp's Line Input can also be recorded via USB to your computer. Note: For recording to your computer with the pa2.2, Music Hall recommends the use of the free Audacity recording software. The Audacity recorder and audio editor for your computer can be downloaded and set-up at http://www.audacityteam.org. Front-Panel Controls: The pa2.2 phono preamplifier/headphone amplifier is equipped with four two-way switches and rotary knob on the front-panel. On/Off Switch: Use this switch to power the unit on and off. Stereo/Mono Switch: Switch between stereo or mono audio output. The sound of mono records is significantly improved by toggling this switch to mono. Phase/Invert Switch: Switches the output signal between absolute polarity phase (0 degrees) and reversed polarity invert (180 degrees). The majority of recording are in phase, but some are recorded inverted phase or out-of-phase. The music will sound more full and rich when matched to the correct phase. Phono/Line Switch: Switches the audio output between phono and line inputs. Volume Knob: Turn this knob to adjust the headphone and variable output volume level. Rigid Extruded Aluminum Housing: The pa2.2 phono preamp/headphone amp features a rigid extruded aluminum chassis to ward off the effects of stray magnetic fields and provide a safe quiet environment for the sensitive electronics it houses, thus providing you with the best sound possible from your turntable. External Power Supply: The pa2.2 phono preamp/headphone amplifier operates off of standard household AC current, using the supplied AC power adapter. The external power adapter is separate from the phono preamp to further improve sound quality. Searches related to the Music Hall PA2.2 Phono preamplifier for moving magnet and moving coil cartridges with USB output and headphone amp.